Wheel & Deal continue to prove their all-encompassing music policy with two odes to dance music of yesteryear, courtesy of new 140 BPM production outfit North Base. Made up of Prophecy, Sonic, Silver, Ikee B and Microcosm there’s enough skills on show to belt out some proper dance floor dynamite. Kicking off with ‘Ruffneck’ and the synths immediately take you back. Air horns and a classic ‘ruffneck’ sample signal a drop into rushing breaks and full-on gnarly b-line to boot. There’s even some ‘baaaad boooy’ time-stretching going on to give it even more authenticity. It’s proper hefty 2012 business though. 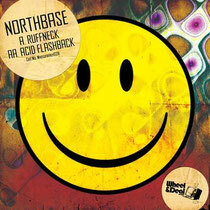 ‘Acid Flashback’ is teasing 303s from the off. Stabs and the USURA ‘open your mind’ vocal then combine over more crashing breaks and devastating bass all brought bang up to date with big room production to make this jump out of any set.